The Park Store is housed in the office/visitor contact station located in the upper solarium of the historic Kannally Ranch House. Items for sale include a variety of books, magnets, notecards, postcards, T-shirts, stuffed animals and educational games. 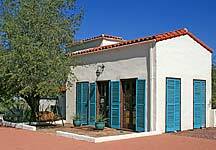 The historic Kannally Ranch House is a museum with historic photos, original artwork and unique design features including Mediterranean and Moorish architecture. Constructed between 1929-33, the house is four levels built up the hillside and is listed on the National Register of Historic Places. Visit the park office/gift shop and take a self-guided tour through the multi-level Kannally family home. The Mediterranean-Revival Style ranch house built 1929-1933 is listed on the National Register of Historic Places. An exhibit of impressionist-style paintings by self-taught cowboy artist Lee Kannally is on display at the Kannally Ranch House. Nearly 30 oils are included in the exhibit thanks to the Oracle Historical Society and Friends of Oracle State Park. See what wild critters show up at the waterhole! Cameras in the park catch images of our four-legged and feathered visitors, which are compiled into a short video presentation. Other exhibits include an extensive plant herbarium, with laminated specimens available for viewing in the park office/gift shop. Over 15 miles of trails can be found within southern Arizona's Oracle State Park. These trails traverse a variety of topography and vegitation features through high desert type habitat. Numerous bird and animal species can be seen from the trails within the park and photo opportunities are frequent. Two ramada shades with picnic tables (10 tables), four restrooms and one charcoal grill. The ranch house and patios may also be reserved for group gatherings. Environmental Education Field Trip Programs for school groups are scheduled weekdays by reservation. For reservations, call the park office at (520) 896-2425. Kannally Ranch House patios with limited seating and four patio tables for picnic use. Oak Woodland Area with eight picnic tables under shade trees, one handicap accessible port-o-toilet; no running water. Five picnic tables under shade trees along Main Road across from Oak-Woodland Area. The park has modern, handicap accessible restrooms at the Group Use Area. There are four composting toilets, each with sink and running water. There is one handicap accessible port-o-toilet available at the Oak-Woodland parking area, with no sink facility. Pets must remain on leash. Pets are not allowed on certain posted trails. It is illegal to remove anything, including plants, wildlife or artifacts. Vehicles must stay on paved road. No wood, charcoal, or ground fires. Oracle State Park is a day-use park, vehicles must exit by 5 p.m. when the main entrance gate will close. Q: Do you have camping? A: No, Oracle SP is a day use only park. The closest primitive camping is Peppersauce Canyon, six miles up Mt. Lemmon Rd. Call Coronado National Forest for more information (520) 749-8700. Catalina SP in Tucson is 23 miles south of Oracle and offers tent camping and RV camping. Call 1-877-MY PARKS (697-2757) for reservations or make reservations online. Q: Does our Golden Age Pass, National Parks Pass or Coronado National Forest Pass work at your park? A: Sorry, no. Those passes are for Federal areas, not state of Arizona land, but Arizona State Parks does offer its own Annual Pass. Q: Can we bring our dog? A: Yes, leashed dogs are allowed on trails, with the exception of the Windy Ridge and Bellota Trail loops. These two trails are used for environmental education programs. Q: Do you have areas for rent? A: Yes, a group use area is available with two shade ramadas, 10 picnic tables, restroom facilities and grills (upon request). The historic Kannally Ranch House, with its beautiful patios, is also available for weddings, reunions, or party rentals. Q: Besides hiking, what can I see? A: You can take a self-guided tour of the Kannally Ranch House. See calendar of events on park home page for information about weekend programs, activities, and guided tours of the house. Q: Are there any other things to do in Oracle and the surrounding areas? A: There are several restaurants, the Acadia Museum (home of the Oracle Historical Society), historic ranches, and art galleries. Plus Biosphere 2 is six miles south of Oracle. Q: Is there hunting in the park? A: Sorry, no. Oracle is a wildlife refuge. Q: Are there any streams in the park? A: Only temporarily after heavy rains. The American Avenue trailhead parking lot is open seven days a week to access the Arizona Trail and to accommodate after-hours use by stargazers. Oracle State Park is a 4,000 acre wildlife refuge in the northern foothills of the Catalina Mountains. The park offers day-use picnic areas and over 15 miles of trails for use by hikers, mountain bikers and equestrians. A section of the Arizona Trail crosses through the park. And it is a designated International Dark Sky Park. Oracle State Park also serves as a Center for Environmental Education and provides programming for all ages. Interactive programs for school groups are offered by reservation. These programs are conducted along trails, so students learn about habitat and the interrelationships between plants, animals, and people.